Trump Administration Strikes Multiple Deportation Deals; What's in Them? - Integration Through Media ....! 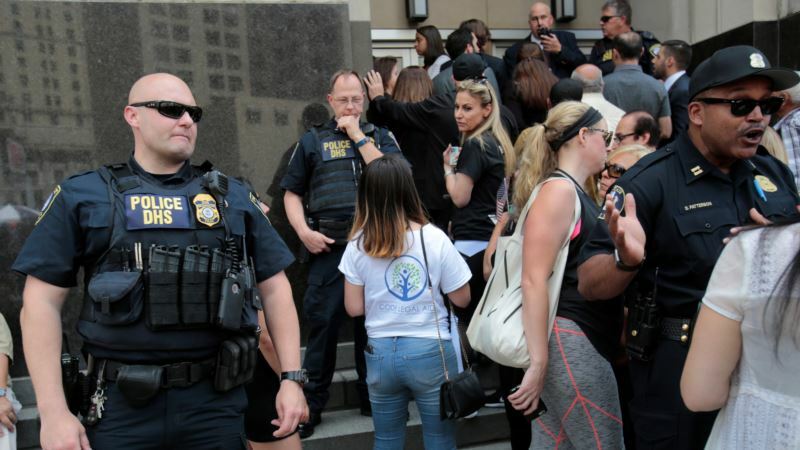 (VOA): The Trump administration reports it has succeeded in reducing the number of countries that refuse to accept citizens deported from the United States. The administration says more than a dozen countries have been removed from the "recalcitrant" list. That opens the path for deportations to begin for some of the roughly 100,000 people from recalcitrant nations who have final orders of removal. There are few details available for many of these deportation deals, raising questions about what's in them. Afghan denials In Afghanistan's case, immigration authorities in Kabul deny there has been any deportation deal struck, despite the Trump administration's claims. Afghanistan's Ministry of Refugees and Repatriations adviser Hafiz Ahmad Miakhel in January urged the U.S. to stop all deportations. "Ongoing war has been forcing people to leave Afghanistan," Miakhel said. "We are a country still at war, and our people need to be helped rather than deporting." Ahmad Shekib Mostaghni, spokesperson for the Afghanistan Ministry of Foreign Affairs, told VOA's Afghan service that Afghanistan has no repatriation agreement with the United States. 'Recalcitrant' list There are nine "recalcitrant" countries on the most recent Department of Homeland Security (DHS) list obtained by VOA. The December 2017 list shows a sharp decrease from the 23 recalcitrant countries identified in January 2016, under the administration of then-President Barack Obama. Four of the countries on the current list are holdovers from the previous administration: Cuba, China, Eritrea and Iran. Five are additions from the Trump administration: Cambodia, Hong Kong, Laos, Myanmar and Vietnam. The process for labeling countries "uncooperative" or taking them off the list is opaque and involves multiple federal agencies. In some cases, deals are based on written, negotiated agreements, though not always, raising questions about what the terms are for countries that negotiate getting off the list. U.S. Immigration and Customs Enforcement (ICE), the agency under DHS that provided the list, declined to comment on the nature of the diplomatic negotiations that reduced the number. A U.S. State Department official told VOA that the department works with ICE "to improve cooperation on removals" with foreign governments. There were 98,679 active final orders of removal for citizens of recalcitrant countries in June 2017, according to ICE. In a 12-month period — for example, in all of 2016 — DHS deported about 450,000 people overall. Deportation process Deportation orders are usually issued after a foreign national violates the terms of his visa, is found to be undocumented or is convicted of a crime. If the person is sentenced to prison for a crime, he may be deported after serving the sentence. If he is detained administratively for an immigration violation, he can be held for up to 180 days while federal officials try to obtain travel documents for deportation. When the United States seeks to deport an immigrant, it generally follows a framework negotiated with the other nation; these are often detailed in writing, through a memorandum of understanding (MOU). Countries that do not negotiate or do not follow these written agreements and refuse to accept their nationals back are deemed "recalcitrant" or "uncooperative." ICE argues that these refusals violate international law. "The United States itself routinely cooperates with foreign governments in documenting and accepting its citizens when asked, as do the majority of countries in the world," ICE officials said in a statement provided to VOA. However, professor David P. Stewart of the Georgetown University Law Center in Washington said international law provides little clear guidance in settling deportation disputes. "It would be nice if there did exist a simple, straightforward, agreed statement of binding international law to refer to. But there isn't," Stewart said. "Many states do provide in their domestic law for a citizen's right to return. Some do not. Some states cling to the notion of a right to expel, deport, denaturalize or refuse the return of folks they don't want, even if they are citizens. It's not uncommon for states to refuse to take undesirable citizens back." A country's decision not to accept its deported citizens from the U.S. can have broader consequences. The U.S. took diplomatic action against Eritrea, Guinea, Sierra Leone and Cambodia last year by imposing visa restrictions. Iraqis in limbo Even when U.S. officials strike an agreement and remove a country from the "recalcitrant" list, there still can be deportation disagreements. Take the case of Iraq: It was removed from the "uncooperative" list by the Trump administration, but many Iraqi citizens designated for deportation are still in limbo. The administration argued in court that it had secured verbal agreement with Baghdad. But in a January court ruling that halted the deportation of 1,400 Iraqi nationals, a judge in Detroit wrote that that kind of verbal agreement was insufficient to process deportations. U.S. District Judge Mark Goldsmith cited testimony from Michael Bernacke, ICE's acting deputy assistant director for the Removal Management Division — East. "In his declaration, Bernacke states that the agreement between the United States and Iraq is not memorialized in writing, but is instead the product of ongoing negotiations," Goldsmith wrote. As a result of the ruling, those possible deportees are now being reassessed on a case-by-case basis. Wisam Naoum, a Detroit attorney, told VOA about 300 Iraqis remain in detention. Others have been released on bond and have filed to reopen their immigration cases. In the meantime, deportations are halted until each has his day in immigration court.